Early in the new year sees the publication of a book that is close to my heart. 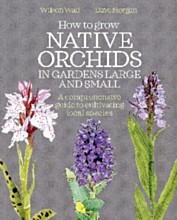 It offers help to people, gardeners and conservationists alike, on growing native orchids in semi-natural situations - wild patches in gardens, road verges, restored meadows, etc. It is a collaboration with my old friend Wilson Wall. We are both passionate about orchids and their conservation, and would like to bring their beauty and fascinating life history to as wide an audience as possible, believing that this is the best way to support their continued existence in truly natural situations. Wilson has used his scientific skills to develop methods of culturing our native orchids and created Bewdley Orchids as an outlet for the plants he grows. For many years I have grown an orchid meadow in my small garden and, as a botanist, sought out and studied our native orchids. With the help of Green Books we have combined and condensed this knowledge and experience into a practical guide and, we hope, an interesting read.